The American Hockey Association, the first professional league in the Midwest, was organized during the fall of 1926. William Grant was selected president of the league- a position he held for fourteen years. St. Paul, Minneapolis, Duluth, Winnipeg and Chicago formed the association's membership for the initial season of 1926-27. The Chicago Shamrocks were the second professional team in the Windy City sharing the market with the NHL Blackhawks. At one time or another fifteen different cities held franchises in the league. 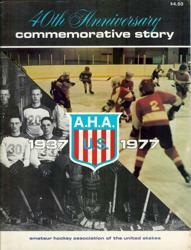 After the 1941-42 season the AHA disbanded due to World War II. After the war the league reorganized as the United States Hockey League for the season of 1945-46. In the league's early years Duluth, Tulsa and Kansas City dominated the league's standings. In the 1935-36 season the St. Paul Saints, with a lineup composed entirely of Minnesota players, won the scheduled season title, but lost to St. Louis in the playoff finals. During the period of 1934-35 through 1941-42 the St. Louis Flyers won several scheduled season and playoff crowns. Hockey was popular in St. Louis during that era and the fans turned out in large numbers to watch such players as: Fido Purper, Oscar and Emil Hanson, Hub Nelson, Pete Palangio, Schrimp McPherson, L. Carbol, J. Matte and W. Huard. Others who donned the uniform of the Flyers included: R. Taylor, W. Brenneman, Jean Pusie, F. Hergert, J. MacKinnon, W. Hudson, W. Harnott, R.Burns, W. Kendall, H. Scott, H. Smith, R. Messecar, G. Milvihill, R. Hudson, and W. Goyer. Minneapolis Millers won the playoffs in 1928, and in 1937, led by Phil Hergesheimer, George Patterson and Bob Blake. In 1940 St. Paul under the tutelage of Perk Galbraith, former Eveleth and Boston Bruins star, captured their only playoff title in the history of the AHA. Oscar Hanson, one of the three Hanson brothers from Minneapolis who played in the AHA, won three league scoring titles in the association's sixteen year history. During the 1938-39 season, Hanson scored 89 points in a 48 game schedule to set a long time standing season scoring record for all of professional hockey. Hanson, who during his career played with three different AHA teams, was a member of the Minneapolis team during the 1938-39 season. Fifty different Minnesota players competed in the AHA during its sixten year history. Players from Eveleth included: Tom and Mike Karakas, Alex McInnes, Paul Schaeffer, Milt Brink, Andy Toth, Joe Papike, Hodge Johnson, Peter Pleban, Joe Kucler, Rudy Ahlin, Art Erickson, Mike Kasher, Oscar Almquist, John Phillips, Sam Lo Presti, John and Tony Prelesnik, Glee Jagunich and Billy De Paul. Those coming from Minneapolis were: Oscar, Emil and Emory Hanson, Manny Cotlow, Virgil Johnson, Don Olson, Phil Perkins, Burr Williams, Bill McGlone, Cully Dahlstrom, Ted Breckheimer, Bill Oddson, Jack Flood and Hub Nelson. From St. Paul came the following: George and Tony Conroy, George Nichols, Bob McCoy, Beef Munson, Emy Garrett, Julie Matscke, Bill Galligan and Bob Graiziger. Hibbing furnished Bill Mickelich, Bob Blake and Joe Bretto while knobby Clark, Iver Anderson and Gus Olson hailed from Duluth and Moose Goheen, Pat Shea and Doc Romnes came from White Bear Lake. Lindstrom was the home for Don Anderson, who played for St. Paul. Five other Americans played in the league including: Curley Kohlman, Muzz Murray and Vic Des Jardins came from upper Michigan while Fido Purper was born and reared in Grand Forks, North Dakota. Bob Nilan originated from Philadelphia, Pennsylvania.